In the film Hollywoodland, Adrien Brody plays a private eye tasked with determining whether TV star George Reeves, famous for playing Superman, did indeed commit suicide or, as his mother suspects was murdered. Brodyâ€™s character remarks that if the biggest headlines are insisting that Reevesâ€™ case is indeed closed, the only way to reopen it is to sway public opinion to the motherâ€™s side by manufacturing their own headlines, simply too large to ignore. In approximately fifty years, we as a culture have moved from the necessity to create large, mass media headlines in order to sway public opinion, to the ability to create small, targeted online posts – incredibly more far reaching, helpful, or hurtful, to a reputation than was ever before possible. When applying this concept of reputation management to a large corporation, whose reputations are the lifeblood of thousands of employees, this is something that cannot be taken lightly no matter how much good will is seemingly stored. Take for example, JetBlue, the first firmâ€™s reputation management disaster covered in this book. Without peeking, what is the first thing that pops into your mindâ€™s eye when thinking of JetBlue? Their stellar reputation, culled over 7+ years as the premier low cost flight alternative? Their unheralded generosity, illustrated via the free snacks available on every flight? Their award-winning service with a smile from flight attendants not yet grizzled or frazzled? Or is it the image of a nightmarish experience of being trapped on a claustrophobic tube stuck to the tarmac in an ice storm for 10+ hours, with no food, toilet or explicable reason why youâ€™re not allowed to get off the darn plane? Despite JetBlueâ€™s best efforts, including public apologies on major news outlets â€“ straight from an old school PR playbook â€“ they simply could not connect with an audience they had built up no existing relationship with. The large headlines they sought â€“ and achieved – in a desperate effort to repair their tarnished relationship, were no match for the far more prevalent, and smaller headlines holding more sway over their targeted community. JetBlueâ€™s case is not unique. Word of mouth, seen on a much larger scale online, will always be influential â€“ and their will always be plenty of good and bad to go around. What JetBlue failed to understand, and again, this is not unique, is how vital it is for a corporation to have a good foundation, or network built in advance to combat a tsunami of negative word of mouth as soon as possible. Take the case of Aquafina, also profiled by Beal & Strauss. Aquafina proactively built its own MySpace community, complete with 11,000+ dedicated friends and loyal followers. Later, when potentially damaging news broke that Aquafina was less a source of effervescent refreshment from the land of sky blue waters, or some such nonsense â€“ than, essentially – filtered New York tap â€“ it had little to no effect on their overall business performance. Is this because consumers are so enlightened that they already know and accept that all bottled water is little more than tap? (Seriously. Bottled water is little more than tap.) Or is it because itâ€™s far easier to manage a bump in your reputation among friends, than among a general audience who is far more turned on by bad news than good news? Know right off the bat that the rules of PR, like SEO, are always changing, and with online PR, this is becoming more & more true.Today, we are in the midst of the â€œTwit-volutionâ€ as Twittr, with its targeted groups and microblogs can hold potentially more sway over harried professionals, who may not have the time to read an entire Sunday edition of the New York Times, no matter how often I they claim to.One of the best strategies a company can implement is to join, or even launch, an online group to communicate with early. Like Aquafina did, build a group of friends and supporters that will have your back, even if you are exposed to be a big refreshing scam. Like the book says, be transparent. Have fun with your business and share what you love about it with your friends and community at large. Even a large, faceless corporation had to have been at one time started by someone who truly loved what they do â€“ at least enough to start the firm.Share these stories from the top with a corporate blog â€“ and why not let your interns post to it once in awhile? When attacked, always begin by taking a deep breath. While it’s important to respond quickly, it’s just as important to ensure you have all the facts, figures, advice – and most importantly, strategy – down to make a good solid case for why your reputation does not deserve to be tarnished.In other words, before you hop into the ocean try to save someone from drowning, it’s probably best to ensure the ladder isn’t stuck up on the boat. In the end, reputation management boils down to ensuring people like you â€“ ideally, enough to want to do business with. With online reputation management, firms have the unprecedented ability to be liked, or disliked by a vast number of people â€“ and the choice is becoming more and more up to them. 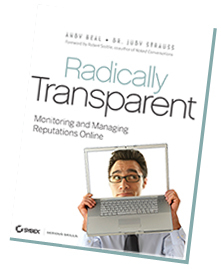 Beal & Straussâ€™ book is a vitally important study, both for those looking to refine, as well as those just learning about, how to best manage an online reputation. Thanks for taking the time to share your thoughts. I’m glad you loved the book! You forgot to mention that Lee is heavily quoted, so our thanks to him for his thoughts. Interesting ideas … nice site, good luck. This was a very well written review. For those who are new to the field, I strongly suggest reading this book as it is full of tips on how to improve your online reputation. I hope that book’s available here in West Oz, Andy’s some sort of Rock Star for this kind of thing, I swear.